The term “Software Radio” was coined by Joe Mitola in 1992  in order to underline the transition from digital radio to the new generation innovative radio, a multi-mode and multi-standard radio definable via software. The Federal Communications Commission (FCC) https://www.fcc.gov defines the SDR as a generation of device radio that can be reprogrammed in order to transmit and receive on every frequency of a specific range. The International Telecommunications Union (ITU) http://www.itu.int has defined SDR as a radio system in which the operative parameters (e.g. frequency, modulation, power) can be set or altered by software. The research reference of this area is the SDR Forum, now called wireless innovation form http://www.wirelessinnovation.org, an international non-profit organization founded in 1996 in order to accelerate the development of radio communication systems based on the concept of SDR. The forum gives another definition: SDR is a collection of hardware and software technologies able to reconfigure the architecture of wireless networks and user terminals. As mentioned before, the SDR captures the RF signal and digitizes it near the antenna. An ideal receiver would have an antenna and an AD converter. A DSP processor would read the data and transform the stream. However there are still limitation to that scheme due to technology of the AD-DA converters relevant to rate and accuracy. 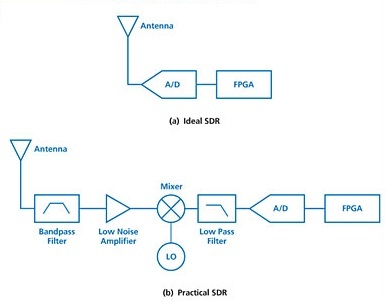 So the common architecture consists of a bandpass filter to eliminate spurious signals, a LNA to amplify low power signals (mW), an oscillator mixer and filter to tune the received signal where it can be then sampled by the AD converter.